With such a diverse cultural heritage including origins from the Berbers of Morocco, a Jewish lineage from Andalusia and dual citizenship from France and Morocco, how could I be anything else other than an authentic nomad? The following editorial is a story about the five years of my life spent with my other family, the Dogons of Mali, an ancient tribe of West Africa believed to be of Egyptian origin, whose astronomical lore goes back thousands of years. 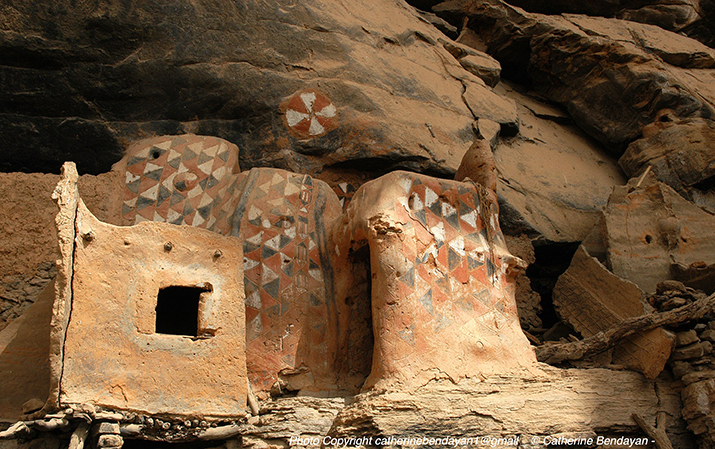 Pooo... which means “hello and welcome” in the Dogon language! These words were pronounced four times according to local tradition upon my arrival in Ende, a Dogon village situated on the edge of the Bandiagara cliffs of Mali. Animistic, the Dogons have their own cosmogenic beliefs and teachings relating to the origin and evolution of the universe. The Dogons are made up of three important families: the first known as Djon, the second, Ono, the third Aru and a fourth occasionally added, called Domo. I was adopted by the Djons, and after several years spent amongst their people, I had the honor of being christened "Sene Guindo". My first given name was Guindo, which in French means "May God enable us to remain together," but which is also the name given to the first of their ancestors who dared to cross forbidden boundaries. My second given name was Sene, as I was the first woman foreigner to become part of their family. So, let me tell you about my life as the adopted daughter of the Dogon tribe, starting with my discovery of their traditions and their cosmic beliefs, which continue to influence my life even today. Funnily enough, everything started by chance, in the mythical and mysterious town of Fez, Morocco, where I was working as the official photographer for the sacred music festival and where I met Michel, a retired gentleman fascinated by African culture and its spirituality, who was attending the festival. During the long hours spent together discussing our mutual interests in the forgotten traditions of the African world and its past history, I told him about my thirty-odd years of traveling the world as a photographer discovering tribes such as the Mongols of Asia, the Nambas of the Pacific Islands of Vanuatu and the Amerindians of Guyane. In return, he told me of his work to help the people of Mali in the construction of a dam to encourage agricultural development in the Dogon region. Several months later I found myself in Mali, at the foot of the sandstone cliffs of Bandiagra, where the magical crossroads of Bamako, Tombouctou, and Mopti on the banks of the river Niger meet. For me, this reportage would turn out to be a unique experience. As I slowly progressed in my education as an adopted member of the Dogon tribe, little by little the cosmic world of the Dogons stretched out before me. Like an imaginary conductor, I found myself rearranging and re-orchestrating the notes of my established knowledge, inspired by the melody of an unknown universe: that of my “lucky star”. I remember exactly when it all started. On a Monday at daybreak. I was Awakened by the termites grinding away at the wall by my carpet bed when I suddenly had the urge to see what happened in the village and gaze upon the extraordinary image of the early morning sun, its day breaking shades of white, red, and orange creeping across the cliff tops, lighting my imagination with the splendor of the moment. I had only seconds to imprint the image when suddenly there appeared a unique star, which I subsequently learned was part of the constellation known as the big dog. Amazed, totally removed from my old reality, I felt like a reborn child, my new life stretching out before me. No other state as this one suits me better. A big-bang occurs in my head. Both partitions of my brain are composed simultaneously. The music of celestial bodies and that of the present symbols in all the cosmogony; everything about the Dogons gives rhythm to the course of my life over there, here and now. My cultural knowledge about them was only "bookish," passed on by numerous ethnologists. I lived these fascinating readings such as the "tales" or “tribal” faiths, as I knew them during my other documentaries. This day was going to be different… After last night's experience, it was now clear that what I had seen was the star, Sirius A, visible to the naked eye in winter… Like the luck of seeing a meteorite streak across the sky in just the right instant, I arrived there at the perfect time to be greeted by my lucky star. For four years I had never seen such a show. Seeing Sirius A, Sigui Tolo, the star of Sigi, is nothing extraordinary; as I experienced, you can see it with the naked eye in winter if conditions are good. As for his companion, Sirius B, Po-Tolo (remember “po”, the Dogon word of greeting), the extraordinary thing is that the Dogon have a perfect and intimate knowledge of this star, even though it is impossible to see with the naked eye. Old societies have known this since 700 BC. Modern western society first learned about the Dogon peoples’ knowledge of the star when ethnologist Marcel Griaule visited them in 1950 and had conversations with the great Dogon spiritual master Ogotomelli. Astronomers confirmed its presence, thanks to giant telescopes, only in 1970. 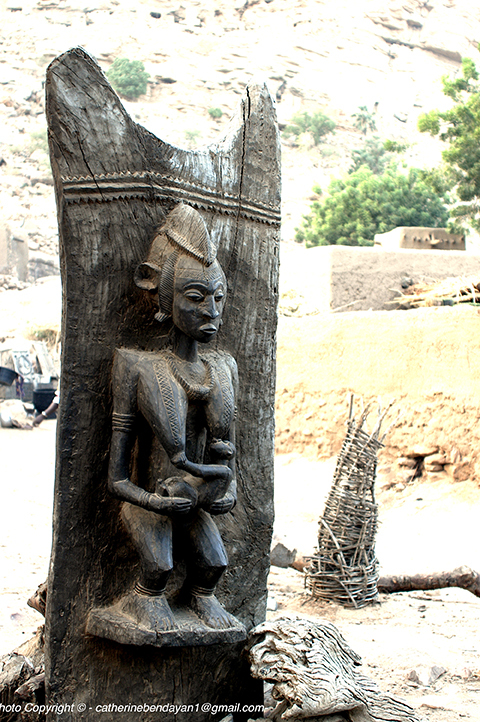 To complete the riddle put to the astronomers, the Dogon also made a reference to the third star, Sirius C, named Emme Ya Tolo, the female star of sorghum. You will understand easily the link between the fertility of the sorghum or millet seed and the creation of the world. After new studies in 1971, the American scientist Robert Temple confirmed the probability of the existence of Sirius C, although at that time, no telescope had confirmed this information and so its existence was still controversial. Of these conversations and calculations brought back by Griaule, the Dogon themselves insist that Ogotomelli did not deliver all the information about the existence of Sirius C. Today, secret societies uphold the theory of the existence of extraterrestrials who came to Earth to create humanity. In Dogon mythology, humanity arose from Nommo, a race of amphibians, which were inhabitants of a surrounding planet close to Sirius. They "would have come down from the sky in a vessel accompanied with fire and with thunder." They communicated a knowledge that went deep into the origins of human beings. This led Mr. Temple to establish the theory that, according to Nommos, extraterrestrial inhabitants of Sirius travelled towards the earth at some point in the distant past, and one crossed to teach the old civilizations (the Egyptians and the Dogons) their knowledge of the trinity of Sirius, as well as about our own solar system. These civilizations then integrated the teachings of Nommos into their faiths, combining them with their mystery teachings. The Dogon mythological system is outstandingly similar to those of the other civilizations such as Sumerians, Egyptians, Israelites, and Babylonians because it includes the archetypal myth of a "Big Teacher” who comes from the Sky. 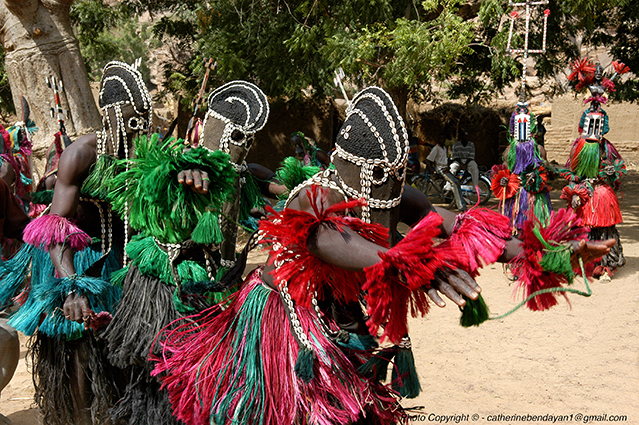 The ceremonies of Sigui that happen every fifty years and last for seven years give rise to the Dogon. This cycle corresponds to the time of a revolution of Sirius B around Sirius A. They commemorate the revelation of the oral word to the people, the regeneration of the earth, as well as the death and the burial of the first ancestor. During the preparations, the initiated leave for the bush to learn with their elder sons the secret language, the sigui-so and the rite of masks. When they return to the village, the people who remained welcome them for a week. The men dress in clothes embroidered with shells, cowries, which they will not wear anymore and which will be burned in a sacred cave after the party. It's the return to the village following the welcome of the dancers and the newly initiated. During the rainy season, the work in fields stops and the party of Sigui lasts about 7 years. It is said that women born during the party are the only ones who have the privilege to attend the dances of masks. It had been four years since I lived in the village, and from time to time I followed the construction of the dam. 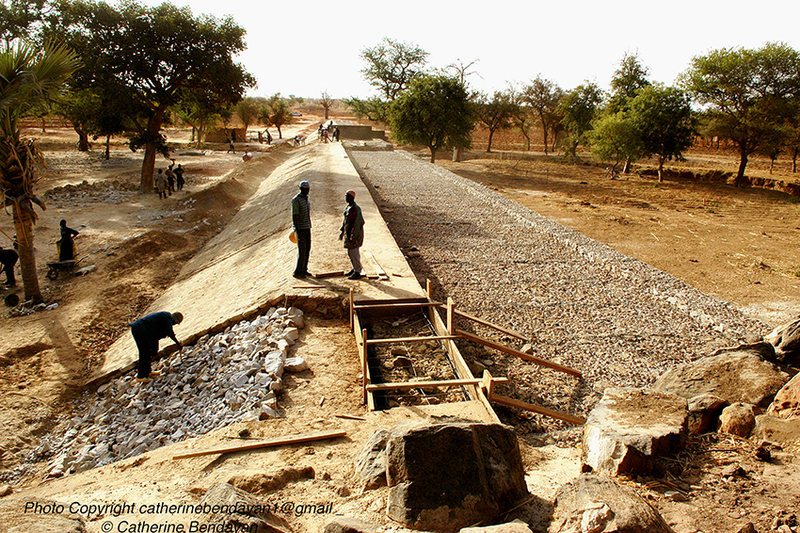 My mission, introduced by Michel, for “A Garden in Mali" was to transmit in images the story of the creation of this dam. 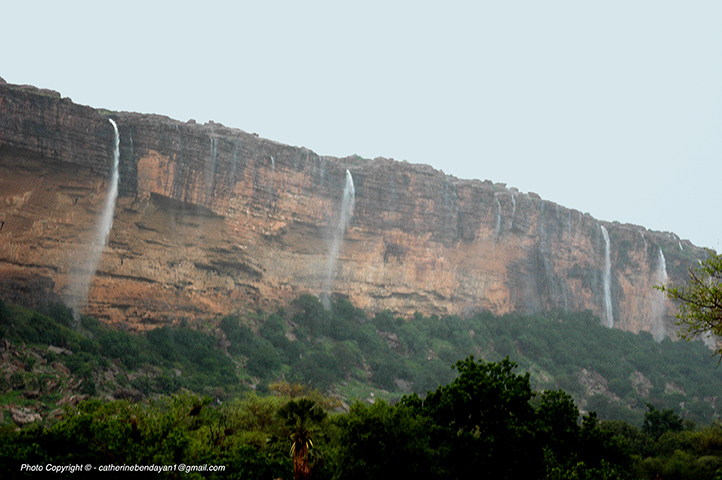 It will retain the rainwater and spread it out onto 17 hectares, allowing truck farming for more varied food than millet and fonio, which constitutes for the Dogon the basis of life. The symbolism is that water is the mother of all life! Thus it was the necessary time for me to question the real reasons for my long presence on this telluric earth, with these villagers of esoteric faiths. I respected the rites of their everyday life with the greatest reverence and perceived the coherence and truth in their message. 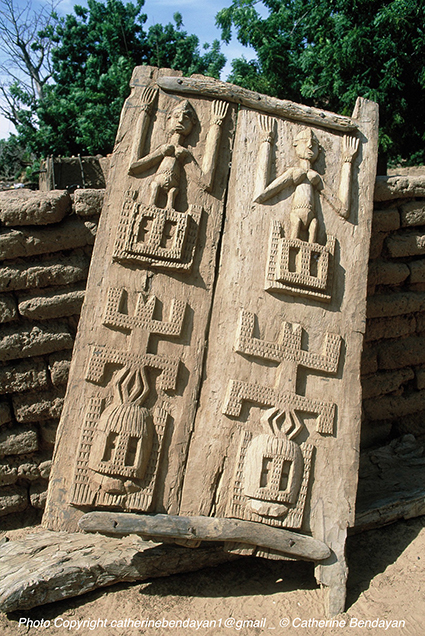 I became attached to the symbolism of the multiple figures of 2, the first twins to have come into the world according to the Dogon faith, in the rite of the word, in the methods of weaving, in the frequent visits to the village. Everything and everybody has a meaning. It was on one particular Monday when I finally internalized everything and felt I understood the details and facts of my life in this community. At the nightfall of this silent day of endless internal inquisition, I decided that like the "pale fox" would break a prohibition. Legend has it that the "pale fox" coupled with one of the twins and created disorder. To punish him, the God Amma deprived him of the word to create the Earth. But what would that mean for me? I decided to break the hierarchy and the rite of the word - a very audacious approach against the importance of the word and silence. Determined to override the long consultations under the patriarchal authority which the women are subject to, I asked Aly, my intermediary, to inform to the village headman that I wished to meet the Hogon, Chief Spiritual of the family Guindo. To my surprise, my request was accepted with a simple nod. 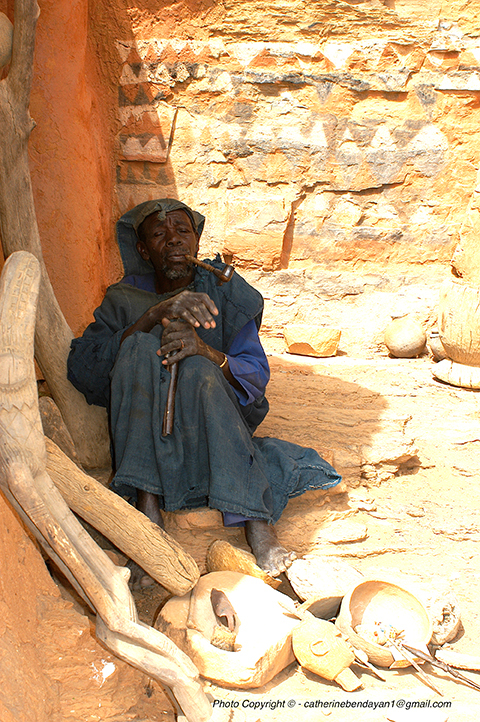 Hogon lives confined in the hollow of the cliff riddled with multiple rocky cavities, where abides the memory of the Dogon (the tellem) and the archives of their spirituality. We spend an afternoon together in total silence. He permitted me to take two photos then made a sign to tell me to sit down next to him, in front of the ancestral rock paintings which represent the snake, the lébé, the first one of the amphibian race. He moves in front of some pieces of pottery and… Silence. 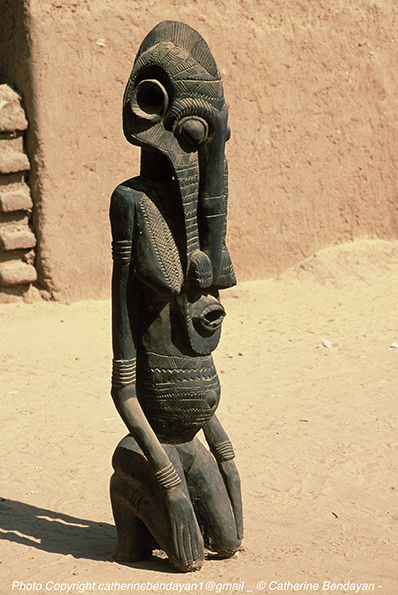 That’s spiritual life with the Dogon. A few months after my visit with Hogon on a certain day I decided to take a walk for some solitude near the foot of the cliff and went for kilometers without my camera and only my thoughts to keep me going. Four hours passed by and suddenly far off behind me the ground began shaking, and a scraggy voice approached. I turned around, and I heard little Issa shouting “Catherine, Catherine!” … At full gallop on a cart pulled by a cow, he roars, "It is necessary to stop you, it is necessary to stop you! You are going to die, it is the day and the place of the sacrifice!" He explains to me that on this day of sacrifice the mythical snake, the lebé, represented on the cave of the Hogon, leaves the cave in search of a living soul, human or animal, to sacrifice. I remember rock paintings drawn on the cave of the Hogon. And I understood that something was going to happen to me, good or bad. What happened next was mythical and unspeakable. I was guided along an unforeseen route of initiation to become an official member of the community. And so, a few months later, after this initiatory path, without a word, in the style of Nommo, God of the Water, I received my Dogon name, Séné Guindo, and was the first foreign woman accepted into the Dogon family. I was adopted! I now feel totally Dogon, and wear my bracelet of shells permanently to symbolize my ties to this family. You will find the events and the anecdotes of this initiatory experience in my future book, to appear in 2018. 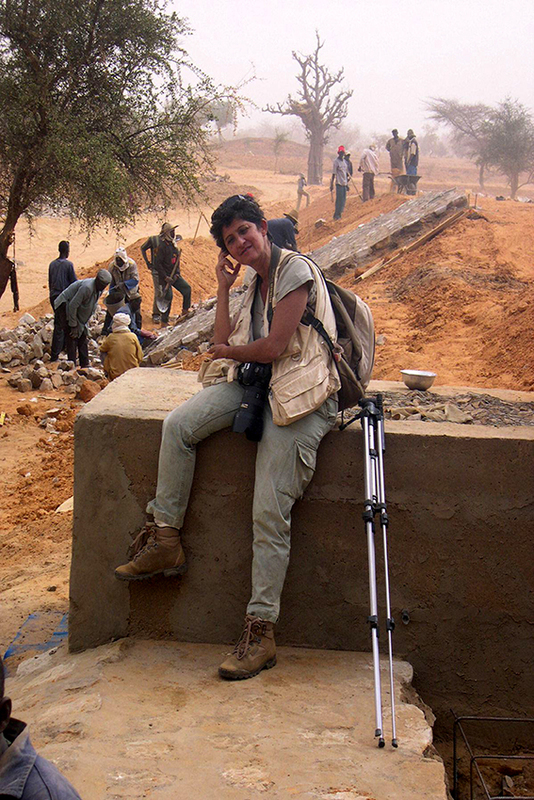 Catherine Bendayan is a Lecturing professor and photojournalist with over 35 years of reportage in the world of Ethnology, Human Geography, and Geopolitics. 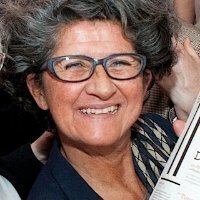 She is a Graduate of the School of Photography in Paris, and of the IAE (Institute of Business Administration) in Aix- en-Provence / Marseille where she obtained a Master's degree in International Strategy and Communication. She is of Moroccan French descent and lives between Paris and Fez in Morocco.